Figure 7.1: The Hard X-ray Detector before installation. The Hard X-ray Detector (HXD; see Figure 7.1) is a non-imaging, collimated hard X-ray scintillating instrument sensitive in the keV to keV band. It has been developed jointly by the University of Tokyo, Aoyama Gakuin University, Hiroshima University, ISAS/JAXA, Kanazawa University, Osaka University, Saitama University, SLAC, and RIKEN. Its main purpose is to extend the bandpass of the Suzaku observatory to the highest feasible energies, thus allowing broad-band studies of celestial objects. 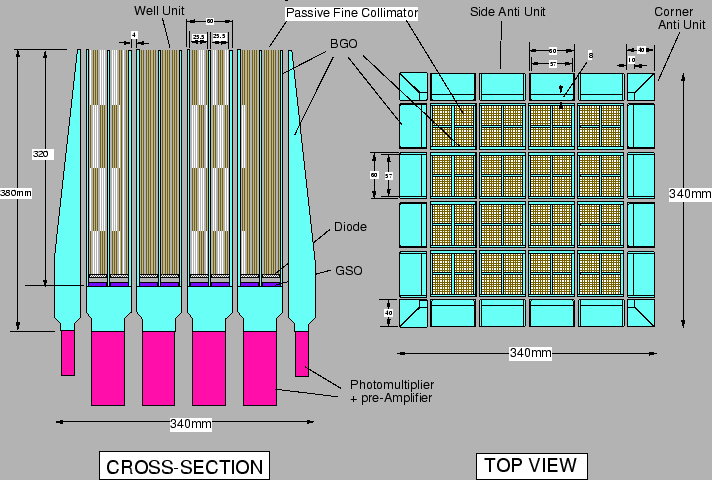 Figure 7.2: Schematic picture of the HXD instrument, which consists of two types of detectors: the PIN diodes located in the front of the GSO scintillator, and the scintillator itself. The HXD sensor (HXD-S) is a compound-eye detector instrument, consisting of 16 main detectors (arranged as a 4 4 array) and the surrounding 20 crystal scintillators for active shielding. Each unit actually consists of two types of detectors: a GSO/BGO phoswich counter, and 2 mm-thick PIN silicon diodes located inside the well, but in front of the GSO scintillator. The PIN diodes are mainly sensitive below keV, while the GSO/BGO phoswich counter (scintillator) is sensitive above keV. The scintillator signals are read out by photomultiplier tubes (PMTs). The schematic drawing of the HXD is given in Fig. 7.2. The HXD features an effective area of cm at 20 keV, and cm at 100 keV; (see Fig. 2.5). The energy resolution is 4.0 keV (FWHM) for the PIN diodes, and % (FWHM) for the scintillators where is energy in MeV. 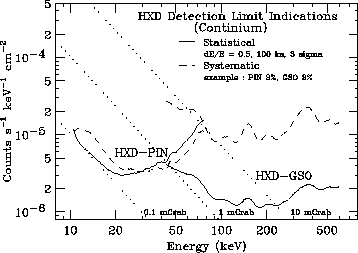 The HXD time resolution is 61 s.
Each main detector unit is of a well-type design with active anti-coincidence shields. The shields and the coarse collimator itself are made of Bismuth Germanate (BGO; Bi Ge O ) crystals, while the X-ray sensing material ``inside the well'' is GSO (Gadolinium Silicate, or Gd SiO (Ce)) crystal. The aspect ratio of the coarse collimators yields an acceptance angle for the GSO of 4.5 (FWHM). Each unit thus forms a 2 2 matrix, containing four 24 mm 24 mm, 5 mm thick GSO crystals, each placed behind the PIN diode. The BGO crystals are also placed underneath the GSO sensors, and thus each well is a five-sided anti-coincidence system. The effective thickness of the BGO active shield is thus about 6 cm for any direction from the PIN and GSO, except for the pointing direction. The reason for the choice of the two different crystals for the sensor and the shield is dictated by the large stopping ability of both, yet the very different rise/decay times, of ns for BGO, and ns for GSO, at a working temperature of C. This allows for an easy discrimination of the shield vs. X-ray sensor signals, where a single PMT can discriminate between the two types of scintillators in which an event may have occurred. Any particle events or Compton events that are registered by both the BGO and GSO can be rejected by this phoswich technique, utilizing custom-made pulse-shaping LSI circuits. The low energy response of the HXD is provided by 2 mm thick PIN silicon diodes, placed in front of each GSO crystal. The geometrical area of the diode is 21.5 21.5 mm , while the effective area is limited to be 16.5 16.5 mm by the guard ring structure. The temperature of PIN diodes are controlled to be -15 3 C to suppress electrical noises caused by the leakage current, and almost fully depleted by giving a bias voltage of 500 V 7.1. The PIN diodes absorb X-rays with energies below keV, but gradually become transparent to harder X-rays, which in turn reach and are registered by the GSO detectors. The X-rays are photoelectrically absorbed in the PIN diodes, and the signal is amplified, converted to a digital form, and read out by the associated electronics. The PIN diodes are of course also actively shielded from particle events by the BGO shields, as they are placed inside the deep BGO wells. In addition, to reduce the contamination by the cosmic X-ray background, passive shields called ``fine collimators'' are inserted in the well-type BGO collimator above the PIN diodes. The fine collimator is made of 50 m thick phosphor bronze sheet, arranged to form a 8 8 square meshes of 3 mm wide and 300 mm long each. The field of view of the HXD changes with incoming energy. Below keV, the passive fine collimators define a FWHM square opening as shown in figure 7.3. The narrow field of view compared to Beppo-SAX-PDS and RXTE-HEXTE experiments is one of the key advantages of HXD observations. Above keV, the fine collimators become transparent and the BGO active collimator defines a 4.5 4.5 FWHM square opening. In summary, all the PIN energy range and the lower quarter of the GSO range has a field of view of , while the GSO events above keV have wider field of view, up to 4.5 . Figure 7.3: An angular response of single fine-collimator along the satellite X-axis, obtained from offset observations on the Crab nebula. Although the HXD is a non-imaging instrument, its instantaneous background can be reproduced through modeling, without requiring separate off-source observations. The HXD has been designed to achieve an extremely low in-orbit background ( c s cm keV ), based on a combination of novel techniques: (1) the five-sided tight BGO shielding as mentioned above; (2) the use of the 20 shielding counters made of thick BGO crystals which surround the 16 main GSO/BGO counters; (3) sophisticated onboard signal processing and onboard event selection, employing both high-speed parallel hardware circuits in the Analog Electronics, and CPU-based signal handling in the Digital Electronics; and (4) the careful choice of materials that do not become strongly radio-activated under in-orbit particle bombardment. Finally, (5) the narrow field of view below keV defined by the fine collimator effectively reduces both the CXB contribution and the source confusion. For example, the CXB is only % of the PIN count-rate and its fluctuation is estimated to be %. Figure 7.4: [Left] A comparison of average non X-ray background spectra of PIN, measured during the first six months of the mission. 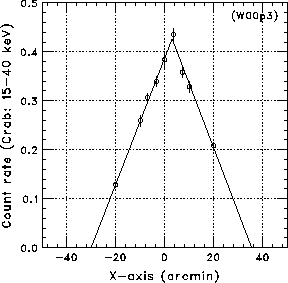 The Crab spectrum scaled down with two orders of magnitude are shown together. [Right] The evolution of averaged GSO-NXB spectra during the first half year after the launch. The non X-ray background (NXB) of PIN diodes, measured in orbit, is plotted in the left panel of Fig. 7.4. The average background counting rate summed over the 64 PIN diodes is 0.6 ct s , which is roughly equal to a 10 mCrab intensity. In addition, almost no long-term growth has been observed in the PIN-NXB during the first year of Suzaku, thanks to the small activation effect of silicon. On the contrary, as shown in the right panel of Fig. 7.4, a significant long-term accumulation caused by the in-orbit activation has been observed in the GSO-NXB, especially at the early phase of the mission. The background spectrum of GSO contains several activation peaks, whose intensities exponentially increased with individual half-lives. Since the longest half-life is about one year, the GSO-NXB level can be treated as saturated in the AO-2 phase. Figure 7.5: A comparison of the in-orbit detector background of PIN/GSO, averaged over 2005 August to 2006 March and normalized by individual effective areas, with those of RXTE-PCA, RXTE-HEXTE, and BeppoSAX-PDS. Dotted lines indicate 1 Crab, 100 mCrab, and 10 mCrab intensities. Figure 7.5 illustrates the comparison between detector backgrounds of hard X-ray missions. The lowest background level per effective area is achieved by the HXD at an energy range of 12-70 and 150-500 keV. The in-orbit sensitivity of the experiment can be roughly estimated by comparing the background level with celestial source intensities indicated by dotted lines. Below 30 keV, the level is smaller than 10 mCrab intensity, which means a sensitivity better than 0.3 mCrab can be obtained, if an accuracy of 3% is achieved in the background modeling. Figure 7.6: [Left] A light curve of the non X-ray background of PIN, folded with the elapsed time after the SAA passage (top), and a plot of averaged cut-off rigidity at the corresponding position (bottom). 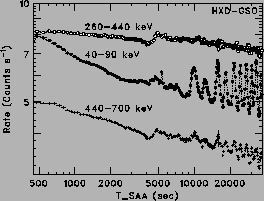 [Right] The same folded light curves of the GSO background, in 40-90, 260-440, and 440-70 keV energy band. Since the long-term variation of both PIN-NXB and GSO-NXB can be expected to be stable, the main uncertainties of the background come from temporal and spectral short-term variations. 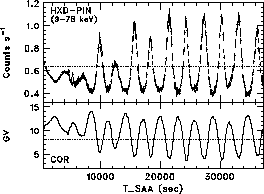 As shown in Fig 7.6, the PIN-NXB shows a significant short-term variability, with a peak-to-peak amplitude of factor 3, anti-correlating with the cut-off rigidity (COR) in the orbit. Since the COR affects the flux of incoming primary cosmic-ray particles, most of the PIN-NXB is considered to originate in the secondary emissions produced by the interactions between cosmic-ray particles and surrounding materials of the detector. When a screening criterion of COR 8, a standard cut > in the pipe-line processing, is applied for the event extraction, the amplitude decreases to a factor 1.5. 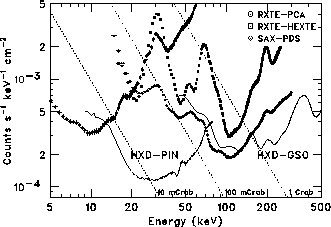 During this temporal variation of the PIN-NXB, its spectral shape slightly changes; larger deviations from the average are observed at the higher energy range. In case of the GSO-NXB, as shown in the right panel of FIg 7.6, the temporal variation differs at different energy bands. In the lower energy range, a rapid decline after the SAA passage clearly appears, in addition to the similar anti-correlation with the COR. Therefore in the background modeling, all these temporal and spectral behaviors have to be properly handled. As is the case for every non-imaging instrument (and in particular, for those sensitive in the hard X-ray range), the limiting factor for the sensitivity of the HXD is the reproducibility in the background estimation. 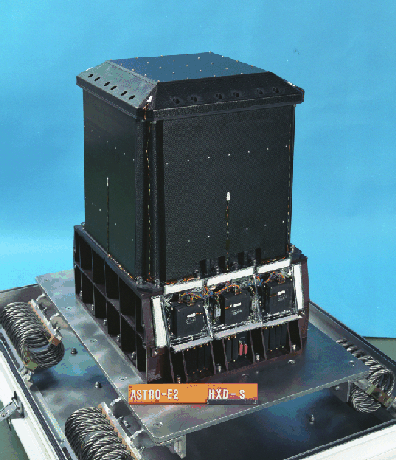 Since this is the first space flight of the HXD-type detector, and the reproduction of the in-orbit background is not at all an easy task, the modeling accuracy evolves with the experience of in-orbit data, and the latest status of the estimation error and procedures will be regularly presented on the Suzaku websites listed in Appendix C. For the AO-2 proposal preparation, the method, limitations, and reproducibilities (as a function of the integration time and the energy range) of the current background modeling are briefly described below. When preparing the AO-2 proposal, authors should evaluate the systematic error in their planned observation based on the information in this document. Figure 7.7: Example of comparisons between the real data and the background model prediction of the PIN-NXB for various time bins of 1, 4, 8, 17, 32 ks, and 1 day, for one SWG observation. Earth occultation data of ten long (a few days) observations are used in the plot. The first 6 panels show the case in the energy range of 15-40 keV, while the last 6 panels do the case in the 40-70 keV. The upper figures show the comparisons of the light curves and residuals. Here the residuals represent the ratio against the total background count rate. The lower figures show the distributions of the residual (red) and the statistical error (black). Figure 7.8: The same plots as the residual distributions of the PIN-NXB modeling shown in figure 7.7, but extracted from ten long observations. Figure 7.9: Similar plots as figure 7.7, but for the GSO-NXB. Figure 7.10: Similar to figure 7.8, but for the GSO-NXB. Figure 7.11: Example of detection limit of the HXD, for continuum (left) and for line (right) detection. Solid lines stand for statistical limit, while dashed lines for an example of systematic errors, the value of which should be evaluated by the authors themselves. In the right plot, no systematic error is presented since it is very difficult to evaluate. See also figure 7.5. See text for detail on both plots. As already mentioned, authors should by themselves evaluate the systematic error necessary to include in one's observation and analysis plan. Here, we present an example of a 100 ks observation aiming at a ``detection" (i.e., not spectroscopy) of any hard emission. 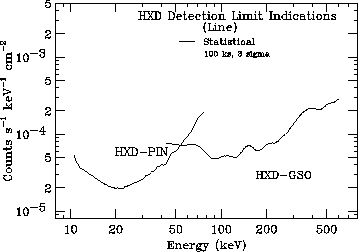 For PIN and GSO, the most sensitive energy bands are at the softest ends. In Figs. 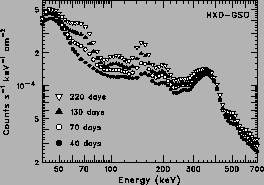 7.8 and 7.10, the HXD background reproducibility of 1-day long observations is found to be % and %, for PIN in 15-40 keV and GSO in 50-100 keV, respectively. Of these, the PIN background is so low that its modeling accuracy is currently limited by statistics of the background database accumulated so far. As the background data become more plenty, the PIN background accuracy will naturally improve, to attain, say, 3% in 1-2 years. Observers can later re-analyze their data using more improved future background models, to get more reliable background subtraction. The GSO background, in contrast, is systematics limited, and hence the strategy for improving its modeling is less straightforward. While the particular examples presented here attain an accuracy of %, it is not yet confirmed that this accuracy can be achieved by all 1-day long observations to be conducted under various conditions. Therefore, observers are recommended at this stage to employ a slightly more conservative estimate, %, as the immediate GSO background modeling accuracy, with a prospect that the accuracy will be improved to % (or potentially even better) through future re-analyses of the same data using improved GSO background modelings. For reference, Fig. 7.11 presents the theoretical sensitivity calculation results; the limit when a 3% systematic error of the background modeling is assumed for both PIN and GSO, and the limit solely determined by the statistical error with a 100 ks exposure. Since the statistical and systematic errors differ according to the situation, proposer should consider the expected errors based on the integration time and energy band they are interested in. For the line detection, the situation is far more complicated. The gain accuracy, response anomalies, and time dependent background spectra should all be taken into account. Authors interested in line detection is strongly recommended to contact the HXD experts. HXD data are accumulated by event by event basis. After on-board data selection, event data are further screened by the ground pipe-line analysis process. By referring to the trigger and flag information (including the inter-unit anti-coincidence hit patterns), the pipe-line assigns specific grades to the HXD events such as pure PIN events and pure GSO events. Detector responses and background files that match the particular grade of the events will be provided by the HXD team. With progress of background modeling, these background files will be updated for all existing observations to date. Note that currently there are no user-specified parameters for the HXD. Tight active shielding of HXD results in a large arrays of guard counters surrounding the main detector parts. These anti coincidence counters, made of cm thick BGO crystals, have a large effective area for sub-MeV to MeV gamma-rays. With limited angular ( ) and energy ( % at 662 keV) resolutions, they works as a Wide-band All-sky Monitor (WAM). Analog signals from normally four counters in each side of HXD sensor are summed up and a pulse height histogram is recorded each second. Thus the WAM is monitoring the hard X-ray universe as well as the Solar flares. If a transient event such as gamma-ray burst (GRB) is detected, four energy band light curve with finer (31.25 ms) timing resolution is also recorded. The energy coverage of WAM is from keV to MeV, and its effective area is cm at 100 keV and 400 cm at 1 MeV. These data are shared with PI and the HXD team; the PI can utilize the full set of WAM data. 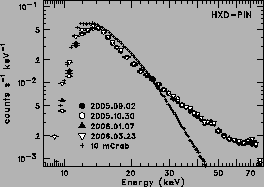 Because these transient events, especially GRBs, need spontaneous contribution to the community, the HXD team will make the analysis products, such as light curves and spectra, public as soon as possible from: .